ARC+ stands for Atlantic Rally for Cruisers and the + is the extra side trip we are doing to the Cape Verde Islands off the west coast of Aftica. The fleet is currently gathering in Las Palmas in preparation for the start amidst plenty of hard work, tears, sweat and a few alcoholic chasers!! We have a crew of 7 to Sao Vincente (one of the islands of Cape Verde) and then 6 across the Atlantic to St Lucia in the Carribean. On our first leg there will be James, myself, trusty Frank, Logan Griffiths (an ex Topdeck Australia driver) who has a plumbing background mixed with marine and boating experience, Chris Berry (our English friend), Michelle Elia (ex Topdeck Catering Manager and chef extraordinaire who has taken time off from the delicious Cicciolina Restaurant in St Kilda, Melbourne to join us) and Michael Roberts (keen yachtie and fiend of Michelle). Our start time is 1.00pm on Sunday 6th November 2016…865 nautical miles. After a few days break on Sao Vincente, we say farewell to Chris, and continue on with 6 for the next 2200 nautical miles which should take us approximately 14 days depending on the wind. There is no turning back but we are hoping for the early Trade Winds to deliver us safely to St Lucia around the end of November. Leading up to our cast off has been as busy as ever and as we are now in the last days with even more to do. We have had a comprehensive safety check by World Cruising – this includes checking all the necessary Man Over Board equipment, Life Raft and its contents, radar reflective capabilities, life jackets, fire extinguishers, ensuring that heavy items such as batteries and even the stove is correctly stowed (in case the boat turns over and they become projectiles – a warming thought! ), and the comprehensive nature of our medical kit and grab bag (the one that you prepack just in case – reminded me of preparing for the maternity hospital). We got a good report but we forgot the whistle on the horseshoe shaped safety ring which you throw overboard when someone falls in…this has now been rectified! Every day new jobs appear like magic – I remember Sal saying to me “Mum, what are you going to do all day?” and at first I did ponder this. I know we have not yet hit the high seas but looking after a boat is like running a house with many more complications. There are grey water and black water systems, gas solonoids, IT and computer issues, pumps that don’t pump but should pump, making sure the gas is turned off at night, working out how to watch a DVD (we have just restarted Games of Thrones from the beginning) and checking that the batteries are recharging so we can use all the switches on our AC & DC panels. One of my jobs is “Parts Manager” – I have to log on an excel spreadsheet all the spare parts we have on board and where they have been stored on the boat so when they are needed we know exactly where to go to find them…and there are hundreds!! Michelle and I have just completed our provisioning with the final delivery of fresh fruit and vegetables to be delivered tonight before our departure at lunchtime tomorrow. 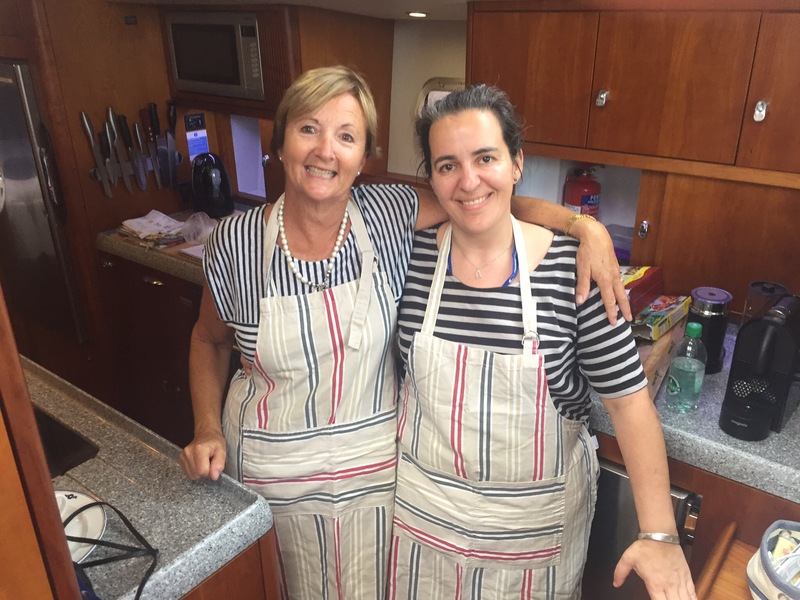 The smell of Thai green chicken curry is wafting through the boat now as dinner for the first night is being prepared by Michelle so that no one has to be in the galley on the first evening ….delicious!! Tonight will be our last dinner ashore for awhile so we are all heading out to eat Japanese/Brazilian fusion (similar to Sushi Samba in London). There is an air of excitement around the marina – tomorrow marks the beginning of many adventures for many people! Follow our progress on http://www.worldcruising.com – Fleet tracker – Miss Tiggy. Fine food, fumbles and land ahoy! Grant and I are in awe of your adventure and send our love and safe vibes to all on misstggy! May your sails be full of wind and your compass point true. So much admiration from me Tig, I am getting sweaty palms just reading about your preparation! Enjoy that curry, sounds amazing, hopefully all will be safe sailing! Tig, all those jobs and you can write a great post, too! Talk about multi skilled. There’s going to be a book in this – I’ll put my hand up to edit! Happy adventures, safe journey, smooth sailing to you and James. Hi Tig , Sandra sent this on….. VERY exciting and Interesting . Hope I can figure out how to sign up ??? may need help ! Anyway , Still planning to meet you in Antigua on or about the 16th December ……….